• Size Closed: 6.25" x 7.25"
• Size Open: 6.25" x 7.25"
A take-your-breath-away collection for car enthusiasts. A 1952 Siata Spyder 208-S. A sleek orange 2014 Chevrolet El Camino. And a distinctive Maserati A6G/2000 Frua Spyder, circa 1957. It’s a yearlong, high-adrenaline celebration of unparalleled automobile design, from antiques and classics to modern marvels and futuristic concepts—plus racers, customs, muscle cars, and more. 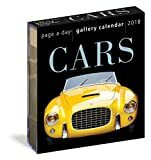 With hundreds of elegant full-color photographs, Cars Page-A-Day Gallery Calendar is the only calendar that matches the passion of the car lover.